I love checking things off my to do list and this weekend I managed to finish one project and make good headway on another. So I decided a couple of open shelves would be a good compromise. 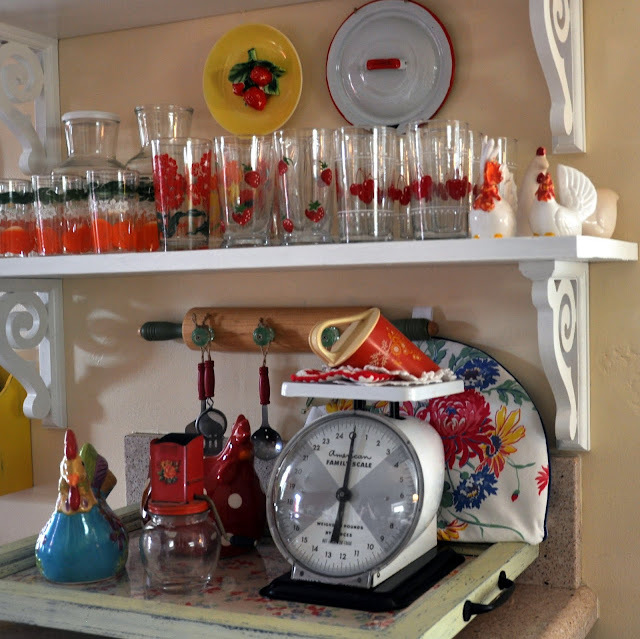 The pretty scrolled brackets are from Home Depot as is the pine shelf. I still need to trim the shelf edge out but overall, I just love the look. Most of the pretty pyrex on the top shelf was given to me and now I have the perfect place to display it and any future pyrex finds. The sweet little cuppa canvases up top were in the dollar bin at Michaels. 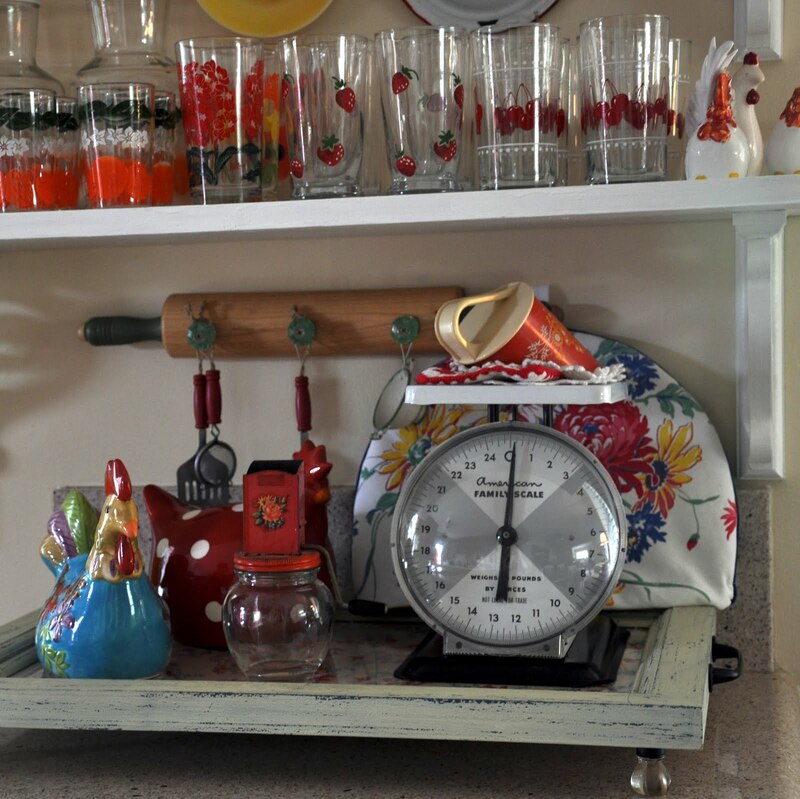 The tray was a treasure I found quite a few years back in Old town Temecula and the vintage scale is my latest find at our new Goodwill in town. It was on the rolling cart to be placed on the shelf when I promptly snatched it up. I found the teal gravy boat that same day. It's not pyrex but it looks pretty along side it. I love having my pretties all gathered together, front and center where I can enjoy them all the time. What a fun display. Love the compromise since you didn't get your open cabinets. I enjoyed looking at all your flower photos. What a score you found from Goodwill with that scale..oh ya, I would be snatching up that beauty also..What's up with our hubbies putting the 'foot down'..(dancing?)..lol. Randy did the same with me when I wanted to take the doors off too,lol. Loved all the vignettes you have made. Just so cheery and bright. How cute and I love all your vintage goodies. Hate when the hubby does that! There is a whole lot of vintage wonderfulness on those shelves. I know which Goodwill you are talking about and that is a great find. I have not found much yet there but I keep checking. I love the retro look of your shelves. It reminds me of my childhood in the 50's. I have some of the same items. They bring a smile to your face just looking at them! I am new to blogland. If you have time check mine out! That looks great!! I love all your vintage finds. So so so cute!!! Love the shelves and everything you have on them...great job!!! 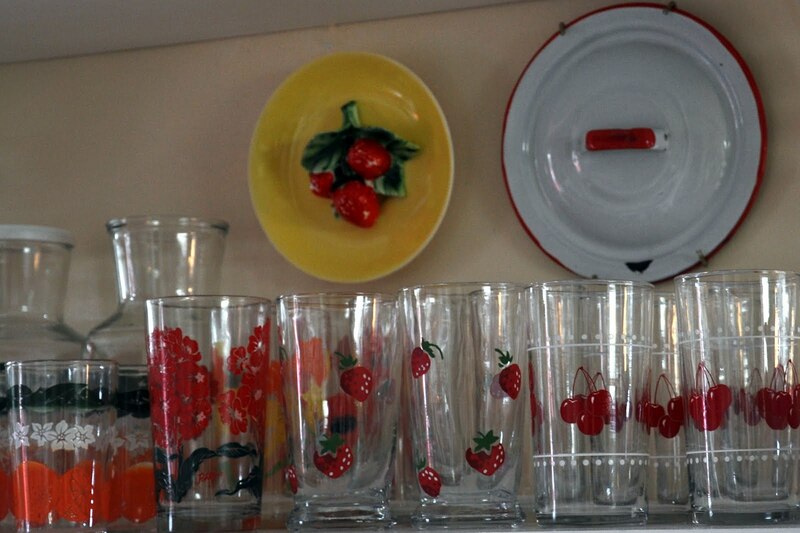 Your colorful and beautiful display brings back fond memories of growing up in the 50's. Oh how cheerful it this...I love it, it just makes you smile! Wow! Jackpot!!!!! I want to go shopping with you! Wonderful finds! I love your open shelving, and the way you have displayed everything on the shelves. That little scale is SO darling, and the tray you found is amazing! 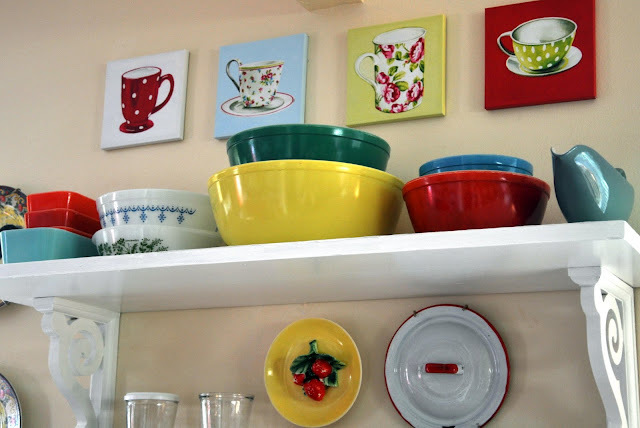 Oh, and I love how you hung that cute pot lid above your shelves, too! Hi, I'm new to your blog and have enjoyed reading through your posts! I love your open shelves! they are just beautiful. Your summer love post brought a smile to my face, as I thought about Brian! I'm now your newest Follower. Please stop by when you have a moment. I love company and new friends are always welcome! Great display, really enjoyed your treasures!